Kenneth Riddle, 23, of Gary, graduates this May with a double bachelor’s degree in health services administration and management. 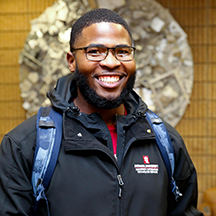 Riddle says that one of the things he appreciated about IU Northwest was the ability to extend one’s resources and create a truly customized educational experience. Connecting with people and being vocal about his interests is what led him to opportunities like working for University Information Technology Services (UITS), for instance, and shadowing professionals at the local hospitals. “I appreciate the close-knit family you have surrounding you at IU Northwest,” Riddle said. 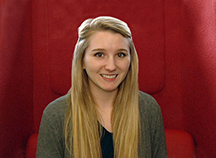 “I definitely feel like you can find your niche at IU Northwest,” Riddle said. Embracing the diversity of the student body and getting involved in student organizations was how Riddle found his place at IU Northwest. He serves as president of the Brother2Brother college success program, and is a member of the Student Alumni Association, the Criminal Justice Association and the National Society for Leadership and Success. Student organizations were key to honing Riddle’s leadership skills as well, an integral part of his education. By participating in such efforts as Brother 2 Brother’s Career Readiness Day, for instance, Riddle received the benefits inherent in helping others. As recognition for his contributions to IU Northwest, Riddle received a scholarship from the Student Alumni Association, which really eased his financial burden, but more importantly, it validated that what he was doing on campus mattered.